Candidates are requested to check their Registration Number Range, Note their Examination schedule and download Admit Card/check Application status as per schedule mentioned above. Candidates must carry at least one photo bearing Identity proof in original such as Driving License, Voter Card, Aadhaar Card, Pan Card etc to the examination centre failing which they shall not be allowed to appear in the examination. It is strictly prohibited to carry bag including ladies purse, phone, gadgets, any electronic & valuable items in the examination centre. There is no arrangement for keeping these items in the school premises. 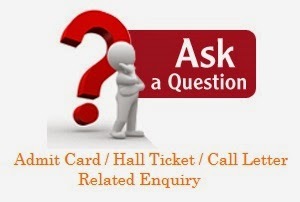 The candidate should be in possession of valid admit card having clear photograph and other details on it, failing which he/she not be allowed to appear in examination.